Wraps your unified customer data with analytics, alerts, and automated workflows to help you build successful customers. Aggregates customer data across multiple tools into 360° profiles, including product usage, subscription details, conversations, NPS scores, and more. Provides analytics around your customers’ product usage, recurring subscriptions (e.g. MRR, churn, trial conversions), and NPS scores. Automate workflows that help detect churn risks, engage accounts, and build customer segments. Captures customer feedback via in-app NPS surveys. 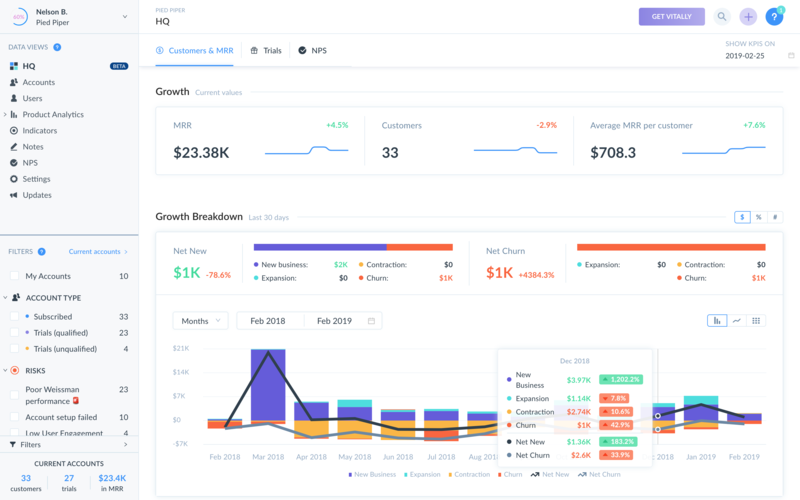 Report across all your customer data, including product usage, MRR, conversations, and NPS scores. Gain a bird's-eye view into a customer’s health and engagement with our 360° profiles. Analyze the KPIs that drive your growth and success and compare KPIs across segments. Pairing Vitally with Segment allows you to start organizing and analyzing your customers in Vitally within seconds. You simply need to sign up for Vitally and click the “Enable with Segment” button in our Segment integration page to get started. That’s it - from there, Segment will start auto-forwarding your users, accounts, traits, and events to Vitally. Vitally automatically processes that data in real-time, auto-organizing it under the users and accounts it belongs to. This means you do not need custom code or a developer to start exploring our Customer Success tools and analytics. If you have access to Segment’s data replay capabilities, Vitally is also built to handle historical imports of your Segment data. This means you’ll have immediate insight into how customers are engaging with your business and product, both historically as well as moving forward. Segment is the infrastructure for your customer data. 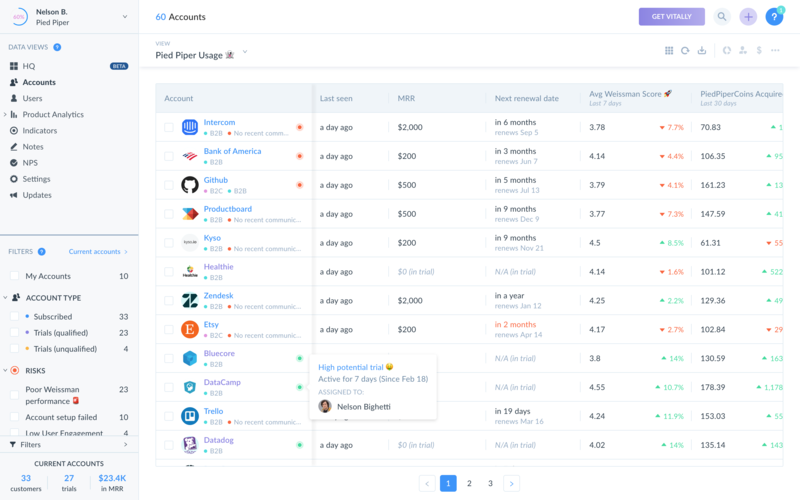 Use one API to unlock 200+ tools for every team in your company. 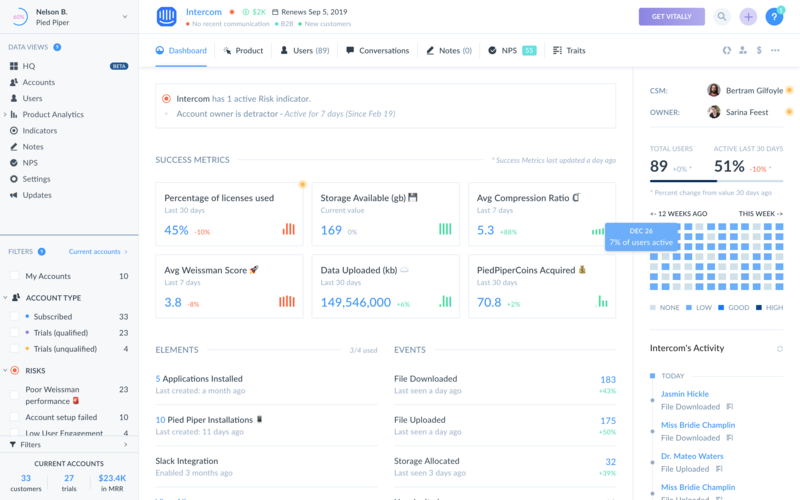 With Segment, developers can stop building tedious and expensive one-off data integrations while business users can get straight to work, turning on their favorite apps right from the Segment dashboard.